In almost three years of marriage husband and I have unsuccessfully tried to figure out the perfect recipe for pot roast. We've tried it in the slow cooker, in the oven, and have yet to find a recipe and method that we love. 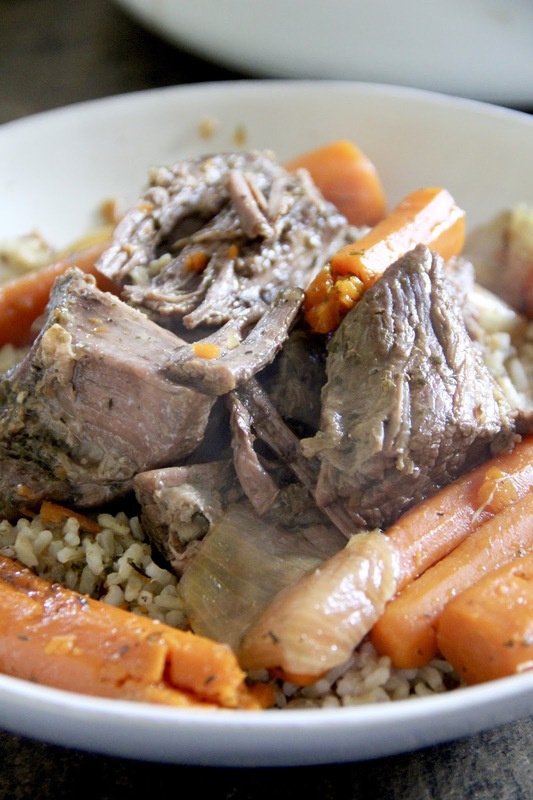 We're picky about it too, which makes it that much more difficult to settle for any ole pot roast. Drizzle the dutch oven with olive oil. Put on medium/high heat. Salt all sides of the roast. Put in the hot oil and sear on each side for 6-9 minutes until the meat has turned dark. 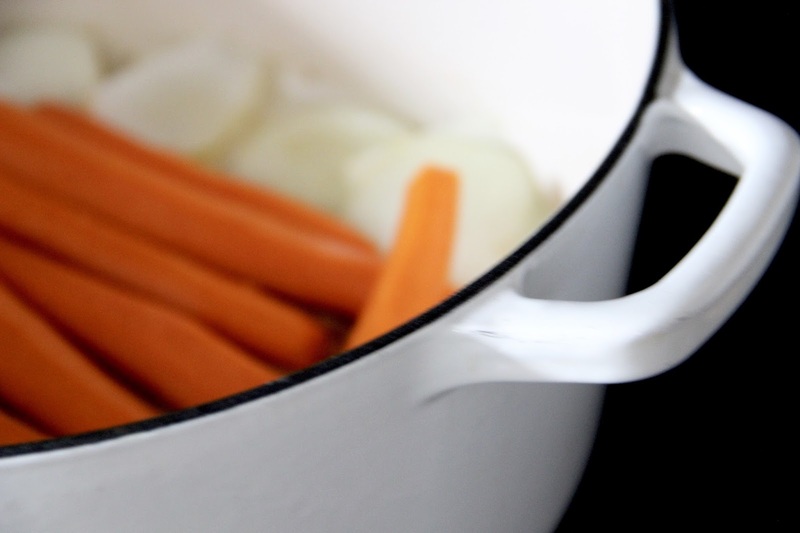 Remove the meat from the dutch oven, and add the quartered onion around the edge of the pot. 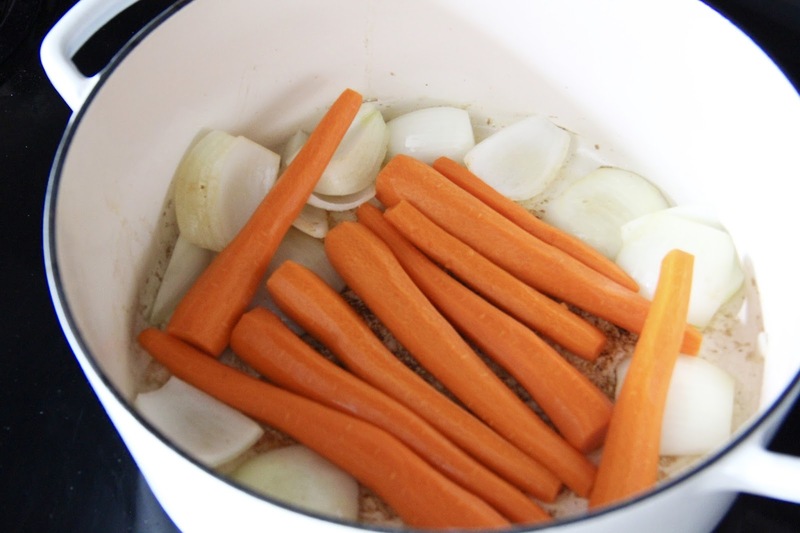 Place the peeled carrots in the middle. Tuck the peeled garlic cloves into the folds of the roast. Next place it on top of the carrots. Pour the beef stock mixture over the meat. Bring it to a low boil, and let simmer with the lid on for 3-4 hours or until the meat falls apart. Serve over rice (we used Brown Minute Rice, prepared 15 minutes before the meat was done). This meal turned out perfectly. Truly, I could gush over it again and again. The meat was super tender, falling apart as we separated it in the dutch oven. The carrots and onions were the perfect complement. This will definitely be one of our staple meals this fall as the weather cools off and the air gets crisp. 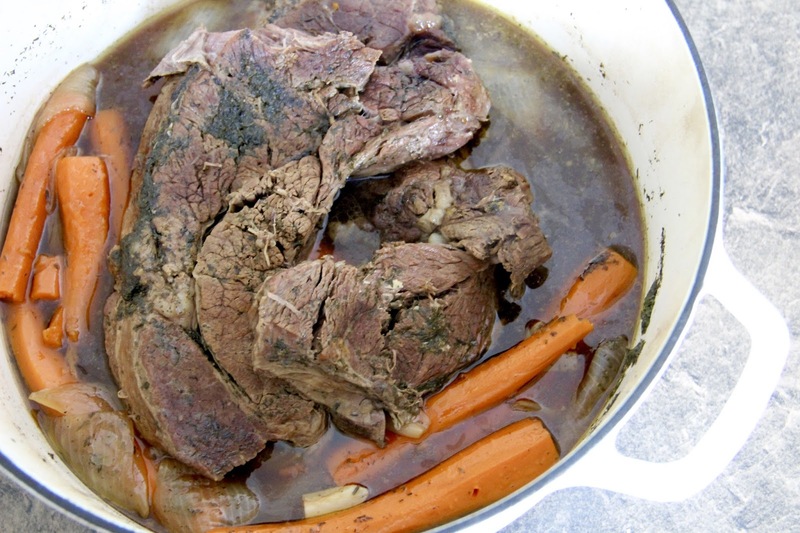 Our house smelled delightful from this dutch oven pot roast cooking all afternoon. If you're a morning church-goer, this is a great meal to put on when you get home. 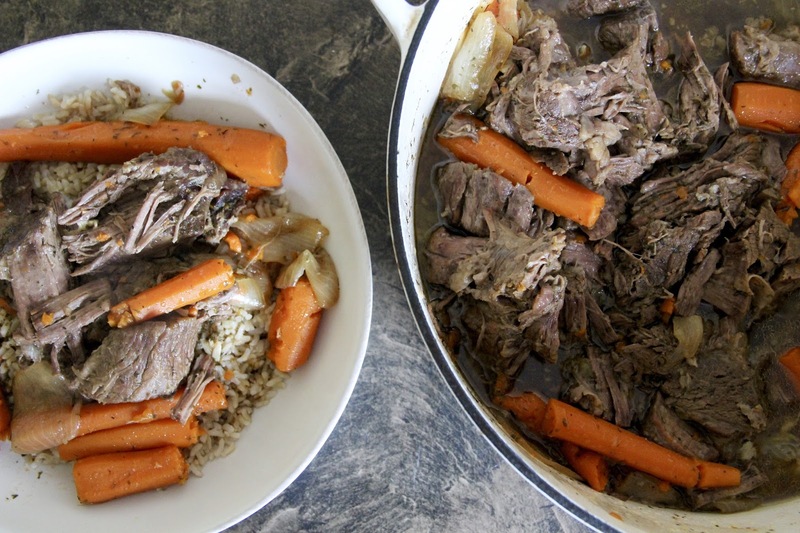 Serve this pretty pot roast roast + veggies over rice and you've got a wholesome, delicious meal for your Sunday evening. Also, if you don't have a dutch oven, I couldn't recommend getting one more! We absolutely love ours (it's a Cuisinart we found at a great price at TJMaxx a couple of years ago)! 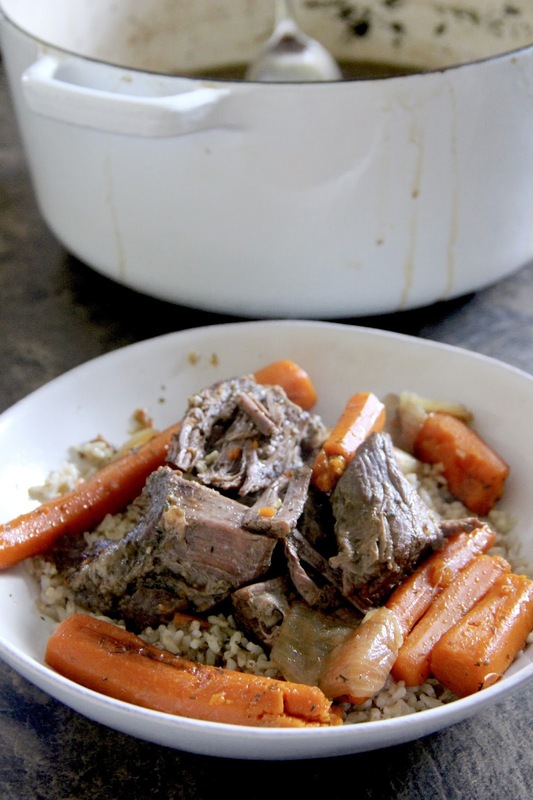 We cook a ton of meals in it from soups and this pot roast to artisan bread. It's worth investing in!